Surface area analysis is a common particle measurement methodology that provides data relevant to a material’s adsorption and dissolution properties, as solid particles primarily interact with other media through their surface area. It is possible to determine multiple characteristics of solid materials by assessing the volume of an inert gas that it can adsorb, and the pressure required to push the gas into a porous structure. It is also possible to assess the interaction of gases with the free surfaces of powder particles. Both techniques provide critical insights for manufacturing of dosage form pharmaceuticals. The Thermo Scientific Surfer is a dedicated surface area analyser that provides ultimate solid particle characterisation through surface area and pore size analysis. 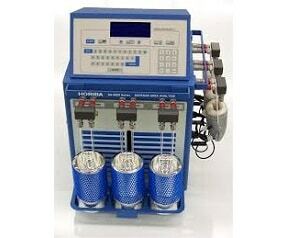 The Horiba SA-9600 series is suitable for both single- and multi-point surface area analysis with a range of 0.10 – 2,000 square meters per gram. Brunauer-Emmett-Teller (BET) surface area analysis is the multi-point measurement of an analyte’s specific surface area (m2/g) through gas adsorption analysis, where an inert gas such as nitrogen is continuously flowed over a solid sample, or the solid sample is suspended in a defined gaseous volume. Small gas molecules adsorb to the solid substrate and its porous structures due to weak van der Waals forces, forming a monolayer of adsorbed gas. This monomolecular layer, and the rate of adsorption, can be used to calculate the specific surface area of a solid sample and its porous geometry, informing studies into the reactivity and bioavailability of pharmaceutical products. Contact us for a quote or to discuss your surface area needs.